Craig AJFK. 2014. Nectar feeding by weavers (Ploceidae) and their role as pollinators. Ostrich 85(1): 25-30. Abstract. Reviews of nectar-feeding by birds initially focused on specialist nectarivores and ignored the role that more generalist feeders may play in plant pollination. Recent work has emphasised the range of bird species, both specialist and opportunistic, that feed on nectar. In this review, I collate published information on nectar-feeding by weavers, highlight known weaver-plant relationships, and suggest areas for future research. There are published records of nectar feeding for Plocepasser superciliosus, Amblyospiza albifrons, Anaplectes rubriceps, two Quelea spp., four Euplectes spp., all six Foudia spp., two Malimbus spp. and 22 Ploceus spp. To date, there have been no unambiguous reports of other genera feeding on nectar. The role of Ploceus species as pollinators of Strelitzia reginae, proposed by ornithologists decades ago, has recently been confirmed by botanists. Current studies of Aloe species in South Africa suggest that opportunistic avian nectarivores such as ploceids may be the chief pollinators of bird-pollinated plants in this genus, whereas specialist nectar feeders (sunbirds) may be 'nectar robbers' in many cases. Particularly for winter-flowering plants, weaver species are potential pollinators, but exclusion experiments are needed to establish their role, while the dietary importance of nectar, and its impact on the birds' physiology, has not been critically studied. Table 1 in this paper lists each weaver species (39 species) that has a published record of nectar feeding, and lists the plant genera concerned. There have been no reports of nectar feeding by the social weavers (Philetairus and Pseudonigrita) or Dinemellia buffalo weavers, and also for most forest species. The first record for a Bubalornis buffalo weaver was published recently, see here. 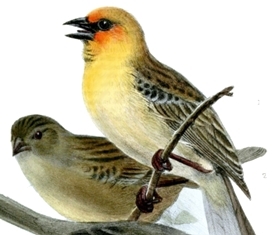 The fodies all feed on nectar, and the Rodrigues Fody has a brush-tipped tongue that is adapted to nectarivory. This paper was first presented at the PAOC in Arusha.